Norway’s and perhaps the world´s finest old school hard rock and heavy metal voice JORN LANDE is at it again. 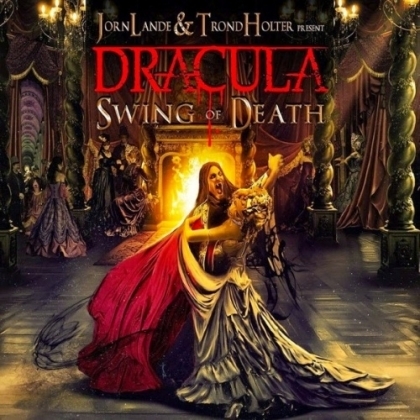 Jorn is Dracula and all Dracula adaptations need a Mina Harker, in this case sung by Lena Flöitmoen, who has a tough opponent but handles the vocals parts in style. After a string of slightly deteriorating solo albums he´s joined forces with Trond Holter, more famed as Teeny of WIGWAM. Jorn is often in need of a songwriter it seems and this guitar fuelled injection might be lucky? There´s normally nothing lucky or hapless or incidental about the vocals, but something´s got to change to get Lande back in the real limelight. Opener “Hands of your God” has the obligatory thunder, a cinematic feel and the ubiquitous bells. It is both pondering and sensitive and the guitar pattern has a sda ring to it. A fine opener but better is still to come. Next up is “Walking On Water”, which is more straightforward, and with more than a nod to the style of the late great RONNIE JAMES DIO. I like the guitar work and the keys are in all the right places. All in all a nice move away from the last few solo albums. The style ranges from straightforward and often DIO-esque to cinematic and variety-like. The title track opens with the sound of an aged records player and all the way to “True Love Through Blood”, an instrumental that reminds me of CANDLEMASS´ “Into the Unfathomed Tower” which makes it just about too heavy for this album. The only track that is a bit like everyone else is the heavy take on THIN LIZZY guitar patterns, “Queen of the Dead”. Otherwise the operatic and pompous story takes the listener through heavy metal and cinematic metal on a winding journey that is really entertaining and seems much more developed and unified than JORN´s later output. Pick of the bunch is definitely the rather straightforward and catchy “River of Tears”. Jorn, make sure this co-operation works as this is among your better efforts in the past ten years!